10:00 am -1:00pm ECOSOC Chamber Multi-stakeholder Partnerships: Making them work for the Post-2015 development agenda Multi-stakeholder partnerships will play a key role in the implementation of the new development agenda beyond 2015. The engagement of civil society, business, philanthropy, academia and others will be vital for advancing the deliverability of resources and enhancing the effectiveness of current and future development efforts. As it is becoming clear that the sustainable development goals and targets are not going to change - maybe a little technical proofing - but otherwise what was agreed last August will stand. The next big issue for many groups is what will the indicators for the targets be and how will they be decided? For work on the indicators stakeholders now have to become knowledgeable of the workings of the UN Statistical Commission. A Commission that has 24 members made up of national statistical offices in the member countries. My understanding last year only one stakeholder attending the meeting of the Commission - this year would expect many many more. So what do you need to be aware of when preparing for the Commission meeting? First though the meeting starts on the 2nd of March in fact it will be informally starting from the 25th of February. Beyond2015, SD2015and theTellus Institute invite you to participate in this advocacy training to help you and your organisation successfully engage government delegates during the remaining post-2015 intergovernmental sessions. Following up on last month's training session, learn how to effectively influence governments and other key decision makers to make sure we bring about the world we want by 2030​. We have decided to cancel the Nexus 2015: Water, Food, Energy and Climate Conference at the University of North Carolina at Chapel Hill, March 15-17. We are grateful for your interest in the Conference, and apologize for any inconvenience this may present. Should you have any questions please email nexus@unc.edu. Time to jail the Bankers? I have blogged on the bankers before who I believe have ‘privatized the profits and socialized the losses’. We have paid for their mismanagement. After the 2008 financial disaster you would have thought that the bankers would have learnt. “And I sincerely believe, with you, that banking establishments are more dangerous than standing armies; and that the principle of spending money to be paid by posterity, under the name of funding, is but swindling futurity on a large scale." Of course it was Gordon Brown in the UK and President Clinton in the US who took away the restrains that kept apart the banking and casino speculation of banks that had been put in after the 1930s recession. While in Bonn at the preparatory meeting for Eye on Earth I took a moment out to meet my 'boss Jurgen Nimptch, Mayor of Bonn. 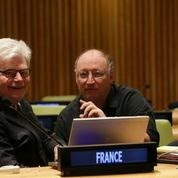 I had the pleasure to work with him and his team when I was chair of the 2011 UN DPI NGO Conference Sustainable Societies - Responsive Citizens. 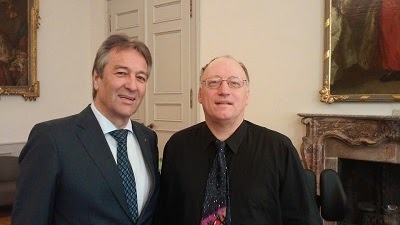 Last year he invited me to join the 'International Ambassadors' for the City of Bonn which I was very happy to accept. I had been unable to go to the original ceremony so this gave me a chance also to pick up my special bottle of wine. It was with great interest that I read Michael Liebreich’s blog on the SDGs. For those of my readers who do not know Michael he is doing great work at Bloomberg New Energy Finance. He and Bloomberg have hosted some very useful meetings on SD finance over the past few years. That brings me to his most recent blog. I can understand that some people are unhappy about the number of SDGs and the number of the targets. As I have said in previous blogs the difference between the MDGs and the SDGs is that the MDGs dealt with just development and developing countries and the SDGs deal with sustainable development and ALL countries. The world is a very complex and we find ourselves dealing with so many issues that are critical BECAUSE previous agreements such as Rio 1992 were not implemented. Lets not make that mistake again.